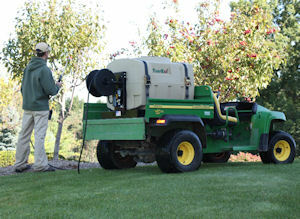 TurfEx introduces its line of skid-mounted spot sprayers. Designed to mount into the bed of any utility vehicle or pickup, the new spot sprayers are ideal for tree and flower watering, pest control, and a variety of other applications. Available with a 50-gal. (model US500) or a 100-gal. tank (model US1000), the units feature fully corrosion-resistant polyethylene tank construction, 50-ft. hoses on 100-ft.-capacity manual-rewind hose reels, and long spray wands with trigger actuation. Featuring 12-volt diaphragm pumps, the sprayers conveniently connect to the carrying vehicle’s electrical system for operation. The pumps move liquid at a rate of 5 gpm at 40 psi. TurfEx spot sprayers are built on a skid-frame mount for easy transport. In cases where the service vehicle can’t carry the unit, an optional trailer kit is available.